The Winstep Start Menu Organizer is an application designed to help you organize and clean your Start Menu. Over time, as more and more applications get installed, the Start Menu can get so cluttered that you end up spending a lot of time just trying to find that program you want to run. This is where the Winstep Start Menu Organizer comes in: it allows you to quickly group your Start Menu shortcuts into a specific set of categories (e.g. Utilities, Internet, Office, etc...) thus making finding what you are looking for a lot easier and much faster! There are two versions of the Organizer, a free and a Pro version. The Pro version of the Winstep Start Menu Organizer is also a component of the Winstep Xtreme suite of applications, a single easy-to-install package featuring all our popular desktop enhancement products for Windows. Start Menu Organizer is free. 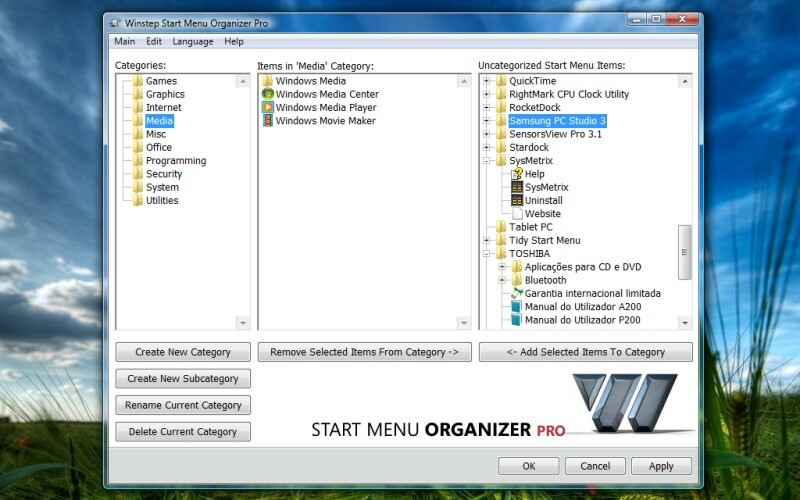 Start Menu Organizer Pro is $19.95. 10 MB of free hard disk space. Screen resolution 800x600 or higher. Bulgarian, Chinese (Simplified), Chinese (Traditional), Croatian, Czech, Danish, Dutch, English, Farsi, Finnish, French, German, Hungarian, Indonesian, Italian, Japanese, Korean, Lithuanian, Norwegian, Polish, Portuguese, Portuguese (Brazil), Russian, Serbian, Slovak, Spanish, Swedish, Turkish. Would you like to receive a FREE Winstep Start Menu Organizer Pro license key and have your name credited? You can by translating the Start Menu Organizer into a language not listed above! Please click here for more information. The free version should be enough for most general purposes as it features ten standard categories. Not enough? The Pro version allows you to create, rename and delete categories and sub-categories! Organizes your Windows Start Menu. Extremely easy to use with intuitive interface. Full Drag & Drop support. Multi item selection and handling. Unlimited Undo and Redo levels. No actual changes made until you are satisfied with the new organization. Start Menu Backup and Restore support. Automatic backup of the Start Menu contents on first run. Support for single click removal of irrelevant shortcuts. Ability to search for and remove dead shortcuts. Includes Update Manager to look for, download, and automatically install new versions. Ability to reorganize all items in the Start Menu, not just the items at the root.